Shahad is head of the Visiting Fellow Program and an assistant researcher at the Asian Studies Unit at the King Faisal Center for Research and Islamic Studies. 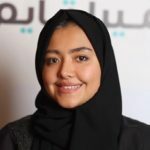 She is the first Saudi female to intern in the Japanese Parliament (House of Representatives), where she experienced firsthand Japanese politics working closely with decision-makers. The Japanese government’s decision to continue restarting nuclear power is shaped by a combination of domestic political concerns, energy security challenges, and its ability to meet climate change commitments and targets. Nuclear power plants have started to come back online, but there is still a question regarding the scope and timing for restarting the remaining reactors. 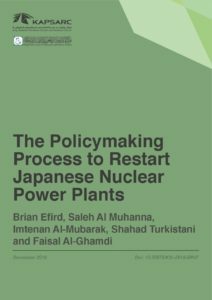 In this paper, we apply a model of collective decision-making processes (CDMPs) to assess the political will for restarting nuclear power plants in Japan. We find that: There is growing political will among Japanese stakeholders to restart nuclear reactors for power generation. Over the next several years, the current political trajectory indicates political acceptance of nuclear power among municipal and prefecture political leaders, who are currently the most significant and consequential opponents to nuclear power. Local governments have the ability to block the restart of nuclear power plants. The process of regaining national support for nuclear power in Japan is expected to take several years of domestic political debate. The Nuclear Regulation Authority (NRA) appears to be a credible and effective voice in building political acceptance of restarting nuclear power plants, given enough time. However, it is important that the NRA maintains its role as an unbiased and fact-based entity, to maintain its credibility with opponents to nuclear power. Despite the turbulence in Japanese politics in 2017, the trend of slowly growing political will in favor of nuclear power appears to be largely unchanged.